If it was that easy to get to position number 1 on Google and other browsers, we would all still be fighting for the top position. So, what can we do personally to push our website business listing higher than our other competitors? 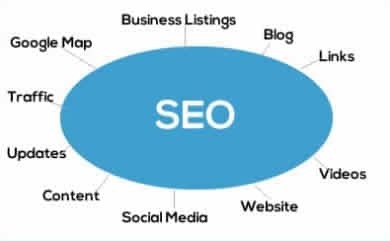 Listed below are some search engine optimisation (SEO) action points to incorporate into your weekly To Do list to get those search engines noticing your listing and pushing you ranking up. Once Google sees that your pages linking to your website are getting popular, they will push your listing up. Does your business have a Facebook, Twitter, Google+, Instagram, LinkedIn, Pinterest page? If so, are you writing content and posting photos on them regularly and are your pages linked to your website? Are you giving your customers something in your regular posts that they will want to keep returning to your pages to read and find out more? However, there is no point having a social media that isn’t used. There’s nothing worse than going to a Facebook page and seeing that nothing has been written since it was set up. Your customer and Google are likely to question whether the company is still in business and Google will push your ranking down. Have you listed your business on Google Maps and Google Business pages which boost local searches? Have you completed all the steps to completing them? Does your website have a Blog? Are you writing articles for the Blog regularly? If you want to rank for certain words and phrases, are you writing blogs about these topics? Is the Blog linked to your website? Have you linked to other businesses within your website and have you asked those businesses to link to your website? For example, if you have a retail store in Sligo selling certain fashion designer brands, you will have mentioned those brands in the content of your website. Have you asked those brand labels to link back to your website as a seller/retailer of their brand? How often do you add to or edit your website content, put up new images, bring it to life by grabbing your customers’ attention with offers, ‘Call To’ Actions on your site, events coming up in your store etc. Think about what your customers would want to read about on your website. Have you simply written that you sell a certain brand but haven’t provided more detail about the brand, the designer, what type of clothes you sell, why your customers like these etc. Always think about providing your customers with the option to learn more information and if you want to be showing up for certain keywords, have you put these keywords within the content of your website? Think of your website as your shop front. You wouldn’t put a display in the window and leave the same display there for months on end. You need to keep the site refreshed. There are many websites which offer you the opportunity to list your business in a local directory. Your listing then gets added to other listings of the same business category. It can be a long tiresome job but well worth doing. Often a video can get a message across more quickly to customers and often people are more likely to click on a video than read a page of writing. Using the two together can therefore increase your likelihood of gaining an audience.